[PDF] Oxford Handbook of Acute Medicine (Oxford Handbooks Series) | Free eBooks Download - EBOOKEE! Description: The management of acute medical emergencies is the most demanding and stressful aspect of medical training. Most textbooks of medicine can only go into general detail about the management of medical emergencies, and it is difficult for the practising doctor to keep up-to-date with the latest guidelines while doing a busy clinical job. 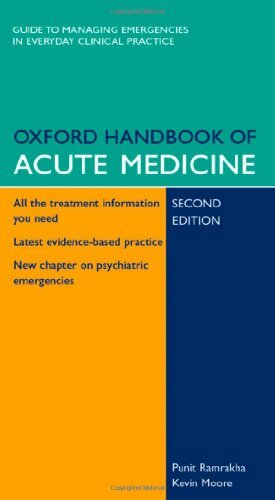 The Oxford Handbook of Acute Medicine is an up-to-date, practical and comprehensive guide to the management of the acutely ill patient. The book relates pathophysiology to clinical features to help the reader make the diagnosis quickly. It identifies priorities for treatment and leads the reader, step-by-step, through the management of the patient while awaiting specialist help. Wherever possible, published guidelines have been incorporated to ensure that the book reflects current, recommended management of medical emergencies, with evidence-based treatments. Details of specialist treatments are included to inform readers about the patient's likely ongoing care. The layout of the book reflects clinical practice: topics are divided into assessment, differential diagnosis, immediate management and ongoing treatment. There is an extensive section on practical procedures. It is the ideal companion for students (keen to understand the management of patients they see during their training), practising physicians at all levels from recently qualified doctors to consultants (to brush upon the modern management of acute medical conditions), staff in A&E who see acutely ill patients daily, and nurses caring for acutely ill patients. No comments for "[PDF] Oxford Handbook of Acute Medicine (Oxford Handbooks Series)".